Strike day: don't travel by auto today! Because of the Delhi autorickshaw strike today, I had to take two buses to get to work. Sure I saved some money--and my green quotient was higher, but instead of 30 minutes, my commute took an hour and twenty. You might think I'd be annoyed, but I'm not. I support the strike, and wouldn't travel by auto at any price today. Autorickshaws may not be the greenest vehicle on the road, but they are far less damaging than private cars, in part because they are smaller and more efficient, and in part because they are a necessary part of many peoples' bus and metro journeys. Efforts to unnecessarily burden autos and their drivers are wrongheaded and unfair. 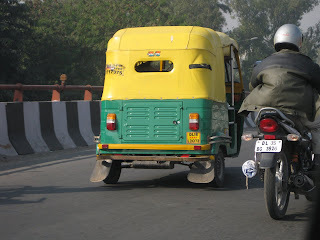 Just so we're clear: of course I know Delhi auto walas can be annoying and often refuse to go by the meter--or even to go at all, depending on where you want to go. But this strike is about something else: the government's attempt to make autowala's pay to have GPS devices installed in their vehicles. The cost? Rs.15,000 per auto, per year. In addition, the government wants to raise other annual fees about Rs. 7,000. All in all, autowalas are looking at having to come up with another Rs. 22,000 a year. And if the GPS is stolen? One autowala said to me, "I'd die." Now the government wants you to believe that autowalas agreed to this when they got the rate hike last year, and that they "have had ample time to save for the installation of the GPS. It should not be difficult monetarily for them to deposit the fee and install the instrument." At least that's what one official told reporters last month. But the idea that a fellow making the income earned by most autowalas can easily come up with Rs. 22,000 is ridiculous. And the idea that last year's rate hike was too high is also silly. Inflation in all sectors is rampant, and people need more to live on. Who complained earlier this month when it was announced that corporate salaries were rising at record levels in India? The increased earnings of autowalas went to all kinds of things. In the last year, the guy I travel with regularly had to pay for an operation for his mother, tuition for his daughter, an engine overhaul on his vehicle, registration and insurance, and food, of course, which we all know is getting more expensive all the time. His wife told him that in order to come up with the extra money demanded by the government, they'd have to set aside another Rs. 100 per day. They'd either have to make drastic cuts in their household budget, or or he'd have to drive longer each day. It's interesting isn't it, that a neo-liberal government that regularly subsidises corporations in a variety of ways wants working class autowalas to pay for their own GPS installation--essentially, to pay to regulate themselves! Also interesting is the rumour that is going around among autowalas: if the unions can come up with enough money--say a crore or ten, then an important minister might be willing to reconsider this scheme. I'm not saying that this is true--but the fact that it's out there says something about the lack of faith so many of us have in our leaders. The autorickshaw union leaders are saying that Shelia Dikshit would like to make Delhi into London or Paris. I've been saying that for more than a year. In fact a year ago, I argued that Dikshit's attempt to phase out autos in Delhi was motivated in part by her desire to make this into a World Class City. Smt. Dikshit doesn't like autos. Autos are are not as green as buses or the metro, but they are not as bad as private vehicles for a variety of reasons. We need to stop attacking these guys. Support the strike--go by bus or metro--or better still, walk! Totally agree! Dixit's policies are all about garib hatao, not garibi, and when she & her cabinet colleagues have gifted themselves an Octavia EACH from public funds, you can't expect any understanding of the poor autowallah's situation. @Lina--you are right; it was so clear during the Commonwealth Games when official policy and practice literally was to banish poor people--not poverty-- from the nation's capital. Very interesting! And yesterday, the govt gave a tax exemption to a cash cow like the ICC! @Revathi: I'm glad you pointed that out. Very strange world, no? Tax waivers to international sports organisatioins with plenty of cash...what next? @Proteep--thanks for sharing that link. I hadn't seen in earlier, but I'm glad I saw it now. @Kuxostub--thanks for the encouraging words.